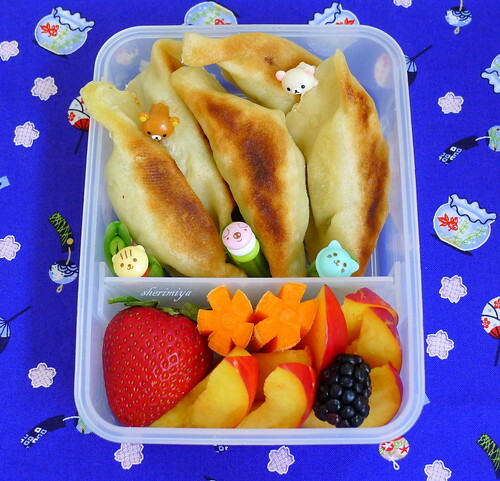 Gluten-Free Gyoza Bento, a photo by sherimiya ♥ on Flickr. Today's bento contains homemade gluten-free gyoza. Really! Ever since deciding to try a gluten-free diet for TinySprite nearly 6 weeks ago, I've been trying to come up with alternatives to all our favorite wheaty foods. So far I've been successful with cookies and breads, but I was worried about gyoza. You see, we love gyoza. And wonton too. But how are we going to make them gluten-free? Well, luckily I'm not the first one to wonder this. I decided to use Andrea Nguyen's recipe and method for making them with mochiko, tapioca and millet. She made it seem easy enough, and even noted that they tasted great! Well, it was hard! Hard for a non-dough-expert like me, anyway. 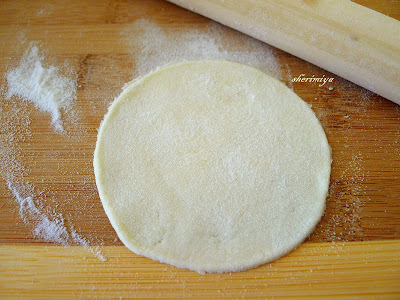 I'm not a fan of rolling and cutting out dough, but for gyoza I'll do it. And if I can do it, so can you! 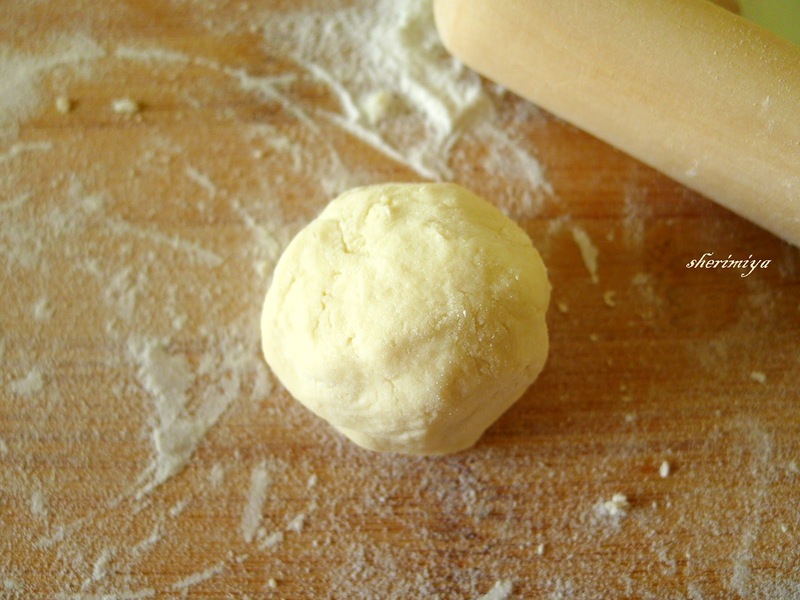 I simply mixed everything up and formed a wettish lump of dough. I pulled off balls about the size of golf balls. Flattened them with my fingers. Rolled them out with a wooden dowel and cut out circles that I thought would be big enough. They turned out to be a bit bigger than standard sized wrappers, but she cautioned that this dough doesn't really stretch and give, so I wanted to make sure I could fill them sufficiently without them tearing. This recipe made about 24 wrappers, but mine were a bit thick since (as mentioned) I was concerned about tearing. 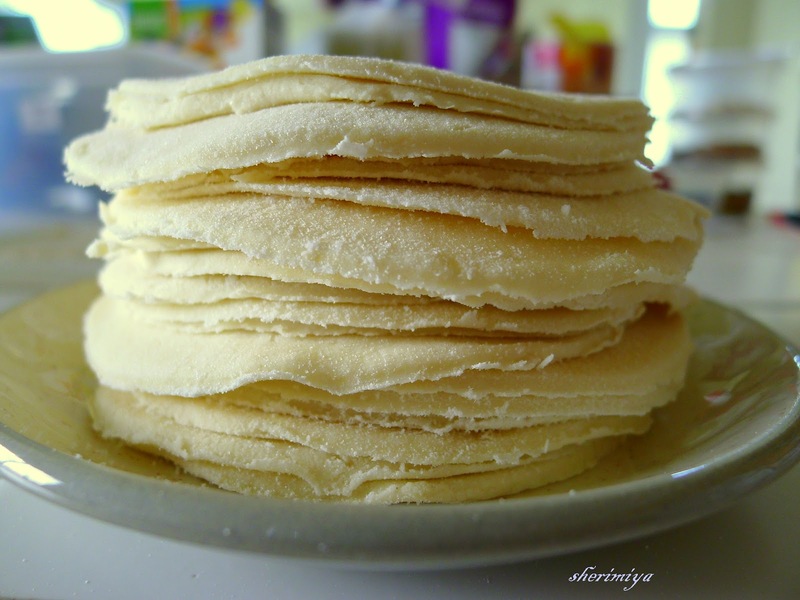 In fact, they look like tortillas, don't they? 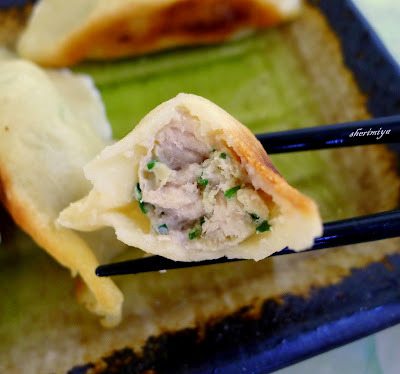 I filled the gyoza wrappers as usual, placing a teaspoonful (or so) of pork and scallion mixture, then folded into a half-circle. 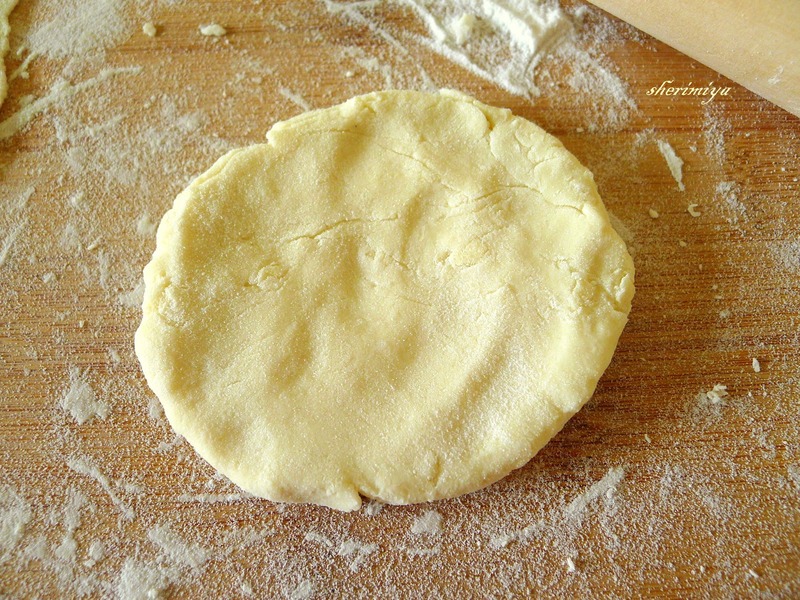 The edges do not glue together like regular skins, but must be pinched together like dough. I was able to make pretty good pleats and close off the edges. These are ready to go into the pan. Yes, they turned out to be a bit thick, but making them bigger was a good move since I could fill them pretty heftily. I pan-fried and steamed them as usual. They developed a crispy bottom and soft tops, and held up pretty well! The wrapper was a bit chewier than the normal wheat wrappers, but not in an unpleasant way. Otherwise, they tasted great! TinySprite loved them! I ended up making the wrappers on one day, storing them in a sealed container in the fridge overnight, then filling them the next day after bringing them back to room temperature. This is due to the fact that the wrapper-making was a bit time-consuming. The wrappers stored just fine, staying soft and pliable without drying out. I'd consider this recipe a success and would definitely make them again! They look great! Seems like you got a nice crunch on the bottom. I got a box of GF pasta made with corn flour and quinoa from my Foodie Penpal this month. We tried it last night and it wasn't bad! Kind of had the texture of a whole wheat pasta. It's amazing how much of our diets are based on wheat, going GF can't be easy! Yeah, I was happily surprised they did turn golden brown on the bottoms! Pasta I probably won't try to make at home since it's readily available (thank goodness), but the pizza and gyoza were big ones. GF shoyu helps a lot too! So happy you want to try it JJ! I think gyoza wrappers are one of the easier GF substitutions to make passably. As long as you make them pretty thin, you really can't tell the difference! I'm trying really hard to make other substitutions, like sourdough bread, and I'm not totally sold on the GF versions. I hope you like this one, and thanks so much for your nice compliments. I really appreciate them!! Healthy Bread in Five Minutes a Day has the best gluten free bread recipes EVER. They smell and taste like real bread. If you let the Crusty Boule dough age in the fridge a few days before baking its like sourdough. I'm so excited to try this recipe, Sheri! I've never made gyoza before, but it's one thing I've wanted to try lately. My son and I have been gluten free for 8 years now, and that means it's been 8 years since we've had gyoza!! Hi Kristie! These wrappers are a cinch if you are comfortable with dough. Really. No yeast or rising or anything complicated at all. I hope you and your son can try it out! Thanks for posting your recipe~ I've been doing some experimenting too, and I have found a good combo of flours (whew!) 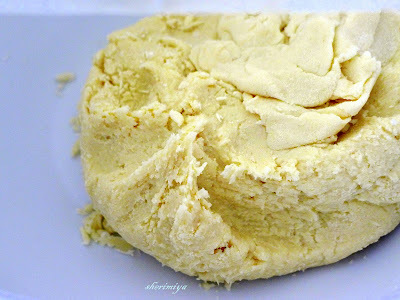 - tonight I am making another batch with coconut flour. Man that stuff smells SO good! Thanks a lot for all your encouragement! No other words can describe this: awesome!!! 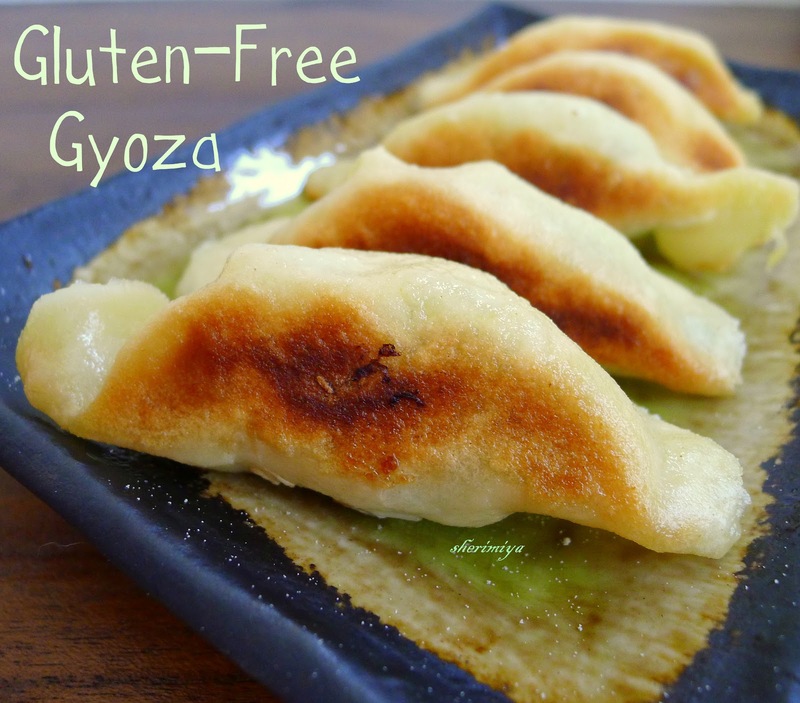 Who would imagine it is possible to make GF gyozas!! You made me curious enough I want to try to make the recipe ^_^!! Oh wait... now I can offer gyoza to my MIL! Thank you so much Sheri!! Feels so good to be capable to offer traditional-all-time-favorite to my folks here *super hug*! 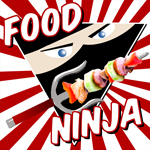 I am just as amazed as you are about GF gyoza!! 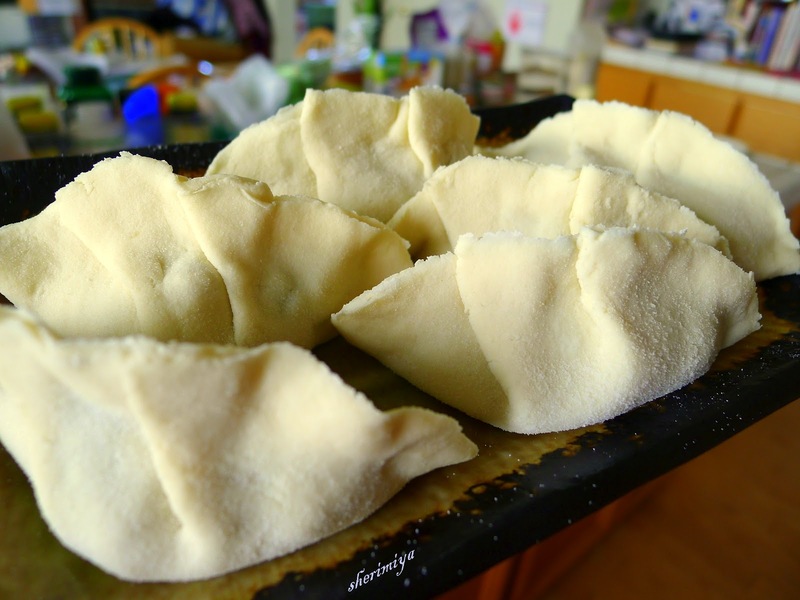 Since you are such a dough expert I'm sure you will have perfectly thin and delicious gyoza to present to your MIL, and she will be thrilled! So glad that GF people don't have to do completely without the most fabulous foods after all. So winning and delish! Loved every last image, too :) Happy almost-Friday, Sheri! Thank you so much for your sweet words Bentobird! Happy weekend to you too!